Two new to me Derek Lawrence productions have been flagged up recently as deserving possible Blackmore session status. 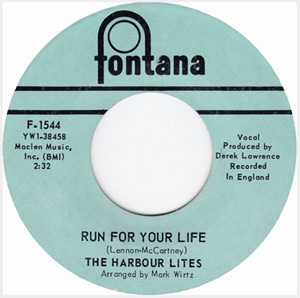 Run For Your Life / Lonely Journey [Fontana F-1544 – USA – March 1966] by The Harbour Lites is very much in the post-Meek Blackmore session vein. The three piece harmony band (all of them named John! Gibb, Mercer and Ross) were from Australia or New Zealand, and had already cut two singles for HMV (produced by others) before Derek sorted this one out as part of his then growing production schedule. Arrangements on the track were by the Grocer Jack writer Mark Wirtz which helps collectability. It was issued in the UK a month later [Fontana TF 682]. The band were apparently quite well known for their Beatles covers (the a-side is the Lennon / McCartney track). Derek is pretty sure it is Blackmore, but it’ll have to go on the possibles list until he finds his studio diary. Which he threw out. Thanks to Derek though we can stick an MP3 of the a-side here. The self-written flip is a pretty awful harmony dirge with no discernable solos of any sort. There was a Manchester band of the same name too which adds to the confusion. Thanks also to Vernon Joynson’s Tapestry Of Delights, Nick Robinson, Tim Summers. The second single we’ve not been able to find any audio for yet. Henry III is the band, the single being‎ So Much Love / Sitting In The Park [RCA Victor ‎– RCA 1568 – 17 Feb 1967]. It’s another Lawrence production, with Wirtz arranging. If anybody can turn this up for a listen do let us know. Dear Simon, the song by HENRY III (side A) is on the Derek Lawrence Sessions Vol 3. So Much Love is included on the THE DEREK LAWRENCE SESSIONS TAKE 3 (Line Records 9.01120 – CD). Thanks Leonard and Konrad. I remember the Lawrence Sessions CDs, they came out in Germany only (though some did find there way here as an import). I had Vol 1 certainly (and the sampler for the series) as we knew the guy who helped put them together (hello Roger Dopson).